After 21 days and 39 presentations, crossing Alberta, BC, and the USA, last week the NEB Panel for Kinder Morgan’s proposed Trans-Mountain pipeline expansion tried to quietly wrap-up First Nations oral hearings on the land of the Coast Salish people in Victoria…but we didn’t let it remain quiet. Sierra Club BC were grateful so many of you heard the call to join us Weds, Nov 26th to rally in solidarity with First Nations, along with Tseycum Chief Vern Jacks and the Wilderness Committee. Many also stayed to bear witness to the moving testimony from this deeply flawed governmental process, for a proposal that was uniformly opposed. A simple summary could never capture the richness conveyed at the Victoria hearings, however themes emerged that I will attempt to briefly unpack: traditional knowledge, stories, and connection to place; intergenerational perspectives and responsibilities; potential impacts of tankers and pipelines; and why this process was a sham. While complete quotes are footnoted throughout this round-up, without exception, these oral histories are worth reading – this is heartfelt storytelling for all Canadians about what is at stake if these projects to go through (here is a link to the full NEB transcripts). The educational and embedded nature of the experiences shared last week by chiefs, elders, councillors, harvesters and community members evoked emotional responses. The pride and connection in these narratives was warmly translated to non-aboriginal ears as unique communities that knew who they were and where they were from. Everyone voiced grave concerns about the risks of oil spills, about impacts on ecosystems, traditions and community, about broken processes and promises, of reserves and residential schools, and cumulative impacts going back to first contact. The importance of reverence for the past was clear, with people tracing the roots of family trees, recalling tales of warriors, chiefs, and grandparents in their lineage. With sadness and disgust, people described the disturbances of sacred spaces and ancestral burial grounds. Old memories of kettles and beach fires, recent elk hunts with grandkids and making drums together; recounting journeys to fish, hunt, gather, preserve, feast, visit, share and talk to the whales; local understandings of time and relating stories of ancestors; people seeing their territories as their “playground”, seas as their “supermarket.” Both Earl Claxton Jr. of the Tsawout and T’Souke Chief Gordon Planes told how ”the Elders always said that when the tide was out, the table was set.” Pacheedaht Councillor Jeff Jones described how their community would travel together for thanksgiving during the coho fishery, harvesting and celebrating with a BBQ right on the beach. There was no acceptance of this quasi-judicial NEB regulatory process as a substitute for the government-to-government consultations that are the Canadian Crown’s constitutional duty. The November 28th open letter from 12 First Nations outlined why this was inadequate consultation, even in the loosest of terms. For example, the Tsartlip’s lawyer thanked the Panel for changing the hearing dates “because it interfered with their fishing season,” however, had they been consulted at the outset, this would have been obvious. Also the basic idea that First Nations were expected to provide comments on incomplete data from Kinder Morgan, is ridiculous. Most felt the Federal government’s participation was insufficient, with Tsartlip Chief Don Tom disappointed there was only one representative present. Later, an important moment was when Lyackson’s lawyer requested the Crown to stand-up, making two representatives Natural Resources Canada and one Transport Canada introduced themselves. While Alberta-based Alexander First Nations were unable to come due to a blizzard, Horse Lake First Nations testified via phone from Grande Prairie, AB. The high costs of travelling prevented their attendance, for they were denied financial help – by some “quirk of the system”, funds were offered after the hearings. “I’m sure I don’t need to remind the Panel,” said their lawyer, “the context we’re talking about here is an $8 billion project.”  Forcing Chiefs and elders to travel great distances, rather than meeting them on their lands was also considered a great disrespect. Three hours each was never going to be enough time to begin to touch upon the complex and important relationships formed between these lands and peoples since time immemorial – it barely provided a snapshot. Given the gravity of what is at stake, this was a process that all Canadians, as treaty peoples, should be offended and embarrassed about. Eric Pelke, Tswaout FN, Friday Nov 28. – Our main mode of oral history was to ask the people to be a witness to what is being said. Be a witness because that’s how the knowledge was passed on and that’s how the information was passed on, by asking everyone to be a witness And you, the Panel, are asked to be a witness to everything that was being said here today, as is our representative from Trans Mountain asked to be a witness to what is being said here today, and also the people that are sitting in the audience, you are asked to be a witness, a witness to what is being said here today because in our tradition, in our history, everyone that attended was asked to be a witness to bring back the information to the others, the people that were not able to make it. Pacheedaht Elder Marvin McClurg eloquently summarized many potential impacts on Thursday, November 27,: Number one impact is to our Aboriginal right to hunt and fish and to live. Another impact is our right to trade and barter with our neighbour tribes, our sisters, our brothers, our neighbours, our families. The risk these tankers pose on us would erase us, would erase our identity, our diets, our rich diets. The impacts on us is the social and economic, political impacts to our people. The shoreline and the ocean holds a majority of our rich seafood diet; sea urchins, crab, gooseneck barnacles, rock stickers, mussels, octopus, herring, smelt, sockeye…we cannot buy our traditional foods from a grocery store. Our market is the ocean, the shorelines, that’s our market. Our roles and responsibilities to our youth and the well-being of our Elders, their knowledge they hold, the history they hold; that’s in jeopardy as well. Tsartlip FN Elder Tom Sampson, Monday Nov 24. -I’m speaking on behalf of my great-grandfather and great-grandmothers. I’m speaking on behalf of my children, my grandchildren, my great-grandchildren, and those children that have not yet been born because if we don’t speak on their behalf, just like the salmon, just like the killer whale, just like the seal, the mountain lion, the wolf, nobody speaks on their behalf. Tsartlip Elder Simon Smith Sr., Monday Nov 25. Belinda Claxton- Tswaout FN, Friday Nov 28. – Before the coming of the Europeans, we were in touch with nature and we used the universe as a giant clock. Our culture and our survival depended on the time of man and nature being one, so much so that we planned our lives around it. The moons told us a change in the weather and signalled our food gathering and spiritual and social activities. Earl Claxton Jr. Tsawout FN, Friday Nov 28 – And that meant that no matter how poor you were, you could still go out and dig clams and catch a salmon and eat like a king. If there’s an oil spill, those eel grass beds are going to be coated with oil and they won’t any longer be a good home for the creatures that live there. T’Souke FN Chief Gordon Planes, Monday Nov 24- places that are very near and very dear to us, the same as Chianno (ph) and Beecher Bay and the same as Songese(ph) and Esquimalt, and that place would be Race Rocks. Race Rocks is a very important place for resources…one of the places that would be a high risk of having a spill. But I can only share so much with you today on that. And I hope when you get a chance, you could go out off our village or come out with us in the middle of the Straits and then you’ll know what we mean of who we are, because the way our Elders and our ancestors did things was not by sitting at these meetings and talking. Chief Casey Horseman, Horse Lake FN, AB Thursday, Nov 27 – A lot of members do work off Reserve and they do work for industry, so we’re not trying to stop industry, but like I said before, we need to regulate how they’re doing their business when it comes to the land. I was once employed by a large industry player. A man –like I said, a man needs to feed his family and when our traditional way of life is being taken from him, he sometimes does what he needs to do for his family. And the more I worked for that company, the more I was pulled away from my community and I found that I was there for the wrong reason; that –I seen what industry or the company that I worked for –what they were doing to the land and how they were treating the people and how they treated me –treated me as a number and they treat people as numbers and it’s all about money and that’s somewhere –you know when it comes to land, I’ve seen what they were doing to the land and it really hurt me. So the biggest relief was the day I left that industry to actually do what I’m doing now, to be able to take care of it. Councillor Kathleen Johnnie, Lyackson FN, Weds. Nov26. – For the people, any oil spill affecting this island will adversely affect the Lyackson Mustimuhw(people) mentally, emotionally, and perhaps even physically, as the stress of a spill would cause them extreme pain which, in turn, could affect their health. Their use of the island would be affected and perhaps curtailed for as much as a quarter of a century of more, as it is witnessed in the Exxon Valdez spill. They would not be able to pass on these teachings to their children and the community’s youth. They could be this could be the equivalent effect of residential schools on the traditional teachings of the community and their language. Councillor Kathleen Johnnie, Lyackson FN, Weds. Nov26- “For their food fishery and traditional foods, the potential impacts might be the effect on the Lyackson food fishery and shellfish beaches may devastate these fisheries and the ocean resources for many years”, noting also the impacts even small spills could have on the tiny islands used by migratory birds and that seals, sea lions haul-out on. Councillor Kathleen Johnnie, Lyackson FN, Weds. Nov26 -Elders in particular said to me that our needs must not be met through initiatives that place a burden on others. And they were talking at the time about the Site C Dam, and they were talking at the time about the interior to lower mainland transmission line and the Vancouver Island Transmission Reinforcement Project. They were saying that our need for electricity should be met here, here at home. We feed ourselves here at home. We trade for other things, but we trade fairly. So our need must be met here. T’souke Chief Gordon Planes, Monday Nov 24– “about five years ago, we did a demonstration project of 75 kilowatts, 400 panels. And it’s a demonstration project that has a light footprint on Mother Earth. One of them being that it is a secluded village where our fisheries building is just totally dependent on solar panels. This one here, where I’m standing, these panels go directly to the B.C. Hydro grid and they actually pay us money for these panels. And we also have an electric car that’s powered by solar panels. And then we have our band administration building that has net zero, and that is that they pay us during the summer months and we pay them back in the winter months and at the end of the year it doesn’t cost us nothing for hydro. These are demonstration projects. We did these kind of projects not for gaining revenue stream into our community. It’s a demonstration. And that demonstration is that the light footprint on what we, as Canadians and British Columbians, can do to start making change that would be beneficial for our children 100 years from now. Now, as stewards, we have a responsibility today, like our ancestors did 100 years ago or 1,000 years ago, and we’re trying to keep with that. And that’s why we’re here today to speak on behalf of the Kinder Morgan application, is to say that what is the price that we have to pay if there was a spill? Tsartlip Chief Don Tom, Monday Nov 24. – I’m disappointed to see that there’s only one representative of Canada here. I was hoping that there’d be someone from Department of Fisheries and Oceans, Transport Canada. All these people there’s many people missing from this who should be here, who should be a part of this. And again, that Canada and the Crown has a fiduciary responsibility and it limits our ability here at the National Energy Board and the oral testimony because Canada, by their own laws, has to come to us, has to come to the community to speak with the heads of the families, not just the Chief and Council, because again, our Douglas Treaty was signed by the heads of our family, not an Indian Act Chief and Council. So the Crown in Canada has a fiduciary responsibility and we will be waiting for their phone call. We will be waiting for a meeting time to set up. Tim Bayley, Council for Horse Lake First Nations, Grande Prarie, AB.- Thrusday Nov 27 – “ I expect many other First Nations might share the same procedural concern. The comment stems from the high cost of getting to this hearing in the first place. Preparing for this hearing and hoping to attend this hearing has been extremely costly for the Horse Lake First Nation, as I’m sure everyone knows, including Kinder Morgan hiring a lawyer, especially lawyers versed in regulatory law is not a cheap endeavour. And then there’s the cost of travel to and from the hearing. Unfortunately, this is a cost that the Horse Lake First Nation could not incur in this instance. 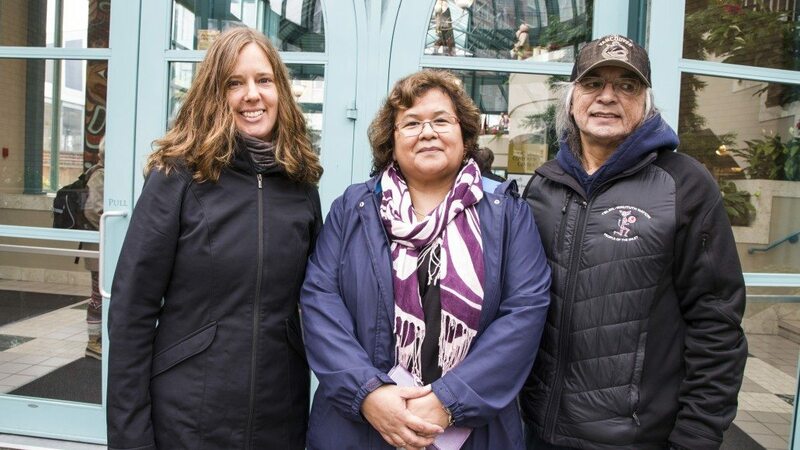 And you will know that, whether intentionally or through a quirk in the system, the National Energy Board does not offer funding for the First Nations until after these oral traditional evidence hearings have taken place, the deadline for such applications being tomorrow, the same day these hearings are scheduled to end. Now, I want to ask the members of this Panel to try and see this matter from the perspective of the members of the Horse Lake First Nation in Hythe, Alberta, 1,400 kilometres from where you sit now. And before you start imagining this, I’ll remind you that it’s currently minus 30 degrees with the wind chill, blizzarding with a 12-inch snowfall warning. I’m sure I don’t need to remind the Panel, that the context we’re talking about here is an $8 billion project. Now with great respect, the Crown has failed to meaningfully consult. Its agent, Kinder Morgan, has failed to meaningfully consult. I refer back to comments made on November 25th before this Panel by Ms. Skeels, counsel for the Stz’uminus people, when she mentioned the fact that the Proponent has not filed all of its intended material. And so in that case, the Stz’uminus and in our case, the Horse Lake First Nation, cannot properly be asked to provide detailed comments about its concerns for the project, especially when we don’t know all the details yet of the project. Even if the Proponent had filed all of its intended documents at this point, Horse Lake First Nations still would not have the appropriate financial resources to have reviewed these filings. When a leader of a nation would like to cross a neighbouring nation’s land, that first leader should ask to be invited to the second leader’s table to talk about how things are going to work out. It is the first leader who is asking an indulgence of the second and not the other way around. Likewise, the Crown should ask to sit with the Chief and council of the Horse Lake First Nation on their land. Tsartlip First Nation Elder Tom Sampson, Monday Nov 24 – …A futile exercise that’s not going anywhere because it’s already been predetermined. The only purpose of this meeting is for the government and the corporations to determine where the hot spots are… “Oh, those Indians are at it again. Let them blow off their steam and they’ll go to sleep if we pay them a few dollars. Give them some money, they’ll keep quiet.” That’s how we’ve always been treated. I’m aware of that. It’s disappointing that we would –after all these years, 500 years of being together, and we haven’t learned to live together yet. Tseycum First Nation Chief Vern Jacks, Wed Nov 26 – What’s in it for First Nations today? Is there economics for First Nations? There won’t be any if there’s a spill. The only economics, if there’s a spill , you’ll hire First Nations to go do your dirty work. That’s what we predict. Tseycum is still against Kinder Morgan. They were in our office and we told them go home, don’t come back. Oh, they promised 65,000. That’s nothing. We could spendthat in half a day. Back on welfare again. These industries, they come and flash a cheque in front of you. Come on, agree with us. There’s no need to do that in Tseycum. We won’t accept it. Councillor Kathleen Johnnie, Lyackson FN, Weds. Nov26- And then, an accident happens, and it’s the First Nations and our ways that are often put out in front of that accident, that are often at the receiving end, at the brunt end, at the damaged end of that accident. But this fight does not end. There’s always one more project. The last thing that I want to share with you is a concept when, at the time of contact, our people named the non-native people qwuniitum, and that name means always hungry, always wanting more, never satisfied people. And it wasn’t a name that was after the colour of the people’s skin or the shape of their eyes or their faces. It was a name that described a characteristic that they displayed. I remember as a very young child, Elders talking about the sqwatti qwuniitum. The sqwatti is not a friendly word. It means crazy, but it means crazy in a bad way. They say, what are those sqwatti qwuniitum up to? What do they think they’re doing? I’ve heard Elders over the last 16 years talk about how the hwelmuk will live when the sqwatti qwuniitum ways take away everything, take away and destroy everything that we have lived on before.